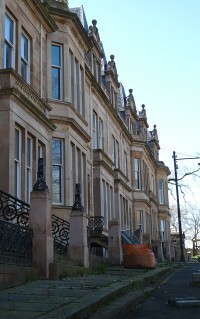 John Honeyman & Keppie designed two lamp standards which were erected outside the home of Robert Miller when he was elected Provost of Hillhead in 1890. He was the last man to hold that office: the burgh was annexed by the city of Glasgow the following year. 1 The lower sections of two decorative, wrought-iron standards survive on the stone piers flanking the steps at the house and probably belong to the Provost lamps. They have classical details which suggest the work of John Keppie. Around the same time, John Honeyman & Keppie also made numerous minor alterations to the terraced townhouse and repaired an associated greenhouse. They later carried out further alterations for Miller's son, Alexander Miller. In 1889, Robert Miller had commissioned the firm to design a memorial to his daughter Constance for Glasgow Necropolis. 1: Glasgow Herald, 31 October 1890, p. 8; Glasgow Herald, 7 October 1891, p. 9; Glasgow Post Office Directory, 1890–1, p. 447; census details for Robert Miller, www.scotlandspeople.gov.uk [accessed 23 October 2012].